It’s snowing! A thick blanket of snow is covering my car, my garden and my street. It’s so lovely to sit by the window, looking outside while curdled up next to the fireplace heater. Whenever I’m whipping up cream, or dusting a cake with confectioners’ sugar, I feel like I’m making snow. The thought of making my own snow is what prompted me to make these iced cappuccino syllabubs. Cappuccino. Cream. Crushed biscuits. Need I say more? Rating: 4- out of 5. - Put the heavy cream into a medium-sized bowl and whip the cream till soft but firm with an electric mixer on high speed. Add the confectioners' sugar and whip until combined. 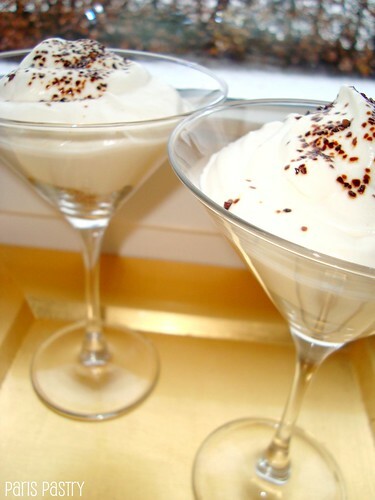 Add the coffee liqueur, whip again. 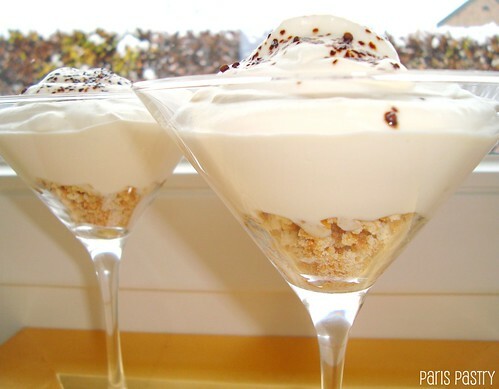 - To assemble the syllabub: put 1 tablespoon of crushed biscuits in a martini glass. Dollup the coffee cream on top, about 4 heaping tablespoons. Garnish with ¼ teaspoon of instant granules. Put in the refrigerator until ready to serve. Has the snow started to come down where you live? Or are you the Luckiest Person in the World and is the sun still shining? looks so creamy...I would try to make it someday! It is not just snowing, but also freezing cold here (4 F). What a perfect treat to enjoy "inside". Oh my goodness - I can't WAIT to try out these new recipes!! Thank you! Looks so... decadent in those elegant glasses. I hate to say it but the sun is shining here and it's a beautiful spring day with my roses in full bloom in fact I'm having my petit-dejeuner out in the garden. oh! now I feel guilty!! but I would love to be able to look out my window some-times & see pretty snow. They sound great and I love your glasses - so festive :) No real snow here yet, but knowing our weather we'll have mounds of it before Christmas! I just love your two blogs; you are just delightful! I can't make all of your recipes, but I live, vicariously, through all of them! Thanks for always leaving me with a smile on my face..
Oooh how delish!! It is very cold/ no snow yet though!! Syllabub is a new treat to me! It sounds like something related to poetry hehe. It looks and sounds great. I'd like to see some snow, but we had a big storm dubbed as "snowmaggedon" last year so I'd like to avoid a repeat, too. Ummm, could you just make me one and send it my way? looks so delish! Loving it! I'm not a fan of the snow but this looks like it would make any snowy day a better one. I pray for snow every year but where I live it rarely comes. And for this Florida girl at heart I am still fascinated and excited by snow. This is some fabulous dessert! Cappuccino is a favorite flavor and I love the snowy, wintery look of it. Perfect!